Rajahmundry: Launching a scathing attack on TD government for ignoring the interests of tribals for a long time, YSR Congress chief Y.S. 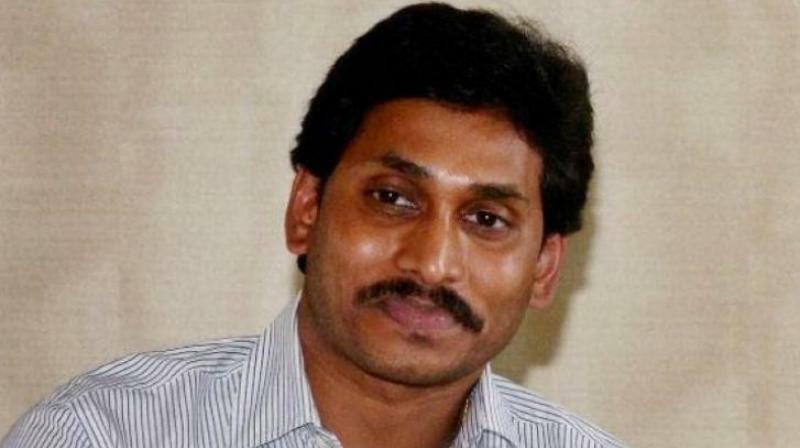 Jagan Mohan Reddy promised a series of sops to benefit them once his party comes into power. Interacting with the tribals during his ongoing Praja Sankalpa Yatra at Prakasaraopelam village under Gopalapuram Assembly segment in West Godavari on Saturday, Mr Jagan wanted to recognise tribal hamlets having population of nearly 500 families as gram panchayats so that several amenities could be developed for their benefit. He said that though it was the prerogative of the Centre to upgrade tribal hamlets as gram panchayats, they would pursue with the Centre to fulfil the long pending demand of tribals to do so. He alleged that as the TD government was not showing any interest to develop tribal hamlets, they were having no medical, education and other amenities causing hardships to the tribals. Meanwhile, tension mounted as activists from YSR Congress and Telugu Desam clashed and raised slogans against each other at Venkata Ramannagudem. As YSRC chief along with his supporters is taking part in padayatra, he arrived to Venkata Ramannaugudem. At the same, West Godavari Zilla Parishad chairman (TD) Mullapudi Bapiraju was proceeding with his supporters to attend Mini Mahanadu scheduled to be held at Tadepalligudem. The vehicles of ZP chairman and his supporters got stuck up in the padayatra of YSR Congress chief Jagan Mmohan Reddy.